Between 1952 and 1963 the British Government performed highly secretive nuclear weapons tests at Maralinga and Emu Field in South Australia and on the Monte Bello Islands off the coast of Western Australia. A total of twelve major nuclear tests were performed, and up to 700 minor 'dirty' trials were also conducted. The area was massively contaminated with radioactive materials and cleanups were attempted in 1967 and 2000. However, examinations after these cleanups found that many of these sites still remain radioactive. 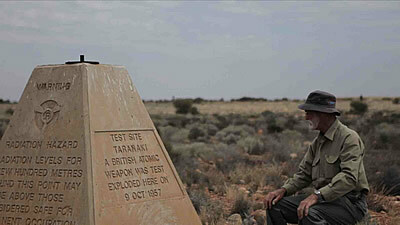 Shot on location at Maralinga in 2011, this short film takes the viewer through a cinemagraphic landscape of the places these bombs were exploded, as well as extracts snippets of memories of Aboriginal elders and Australian nuclear veterans, whose lives have been deeply impacted by these tests.